John Byrne took over the reins of the Incredible Hulk in late 1984 in the first ever creative team cross-over in comic book history. In Hulk #313 and Alpha Flight #28, Byrne passed Alpha Flight on to current Hulk writer Bill Mantlo and a young Mike Mignola of Hellboy fame. “Well, I want to get back to the basics. I want to get back to the two elements of the Hulk that are the most primal Hulk, to me. One is the creature of the night – as he was in those early issues of the Incredible Hulk. In issue #315, Dr. Samson succeeds in splitting off the mind and body of Bruce Banner from the Hulk. S.H.I.E.L.D. steps in and decides to take over the project, but Samson objects and frees the Hulk. 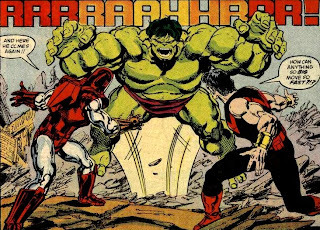 Unfortunately without Banner’s influence, the Hulk is just an angry, rampaging monster. The Avengers fail to take down the Hulk and Samson calls them off vowing to bring down the Hulk himself. I liked the way the supporting cast, Doc Samson and the Hulk Busters, shared the spotlight. It wasn't all about the Hulk, but about those whose lives the Hulk affected. This arc revealed a lot more of Samson's character. Byrne took the title in a new direction shifting from the idea of the internal Banner-Hulk conflict to a more physical one. It would have been interesting to see what the genius of Bruce Banner would have devised to take on the Hulk. Issue #316 features one of my favorite Hulk battles. Namor, Hercules, Iron Man, and Wonder Man each take turns trying to take down the Hulk. Meanwhile, Banner who has recovered from the traumatic separation leads a group of highly skilled individuals dubbing them the Hulkbusters. They’re first real training mission is interrupted by Dr. Samson and their ensuing battle ends up costing the lives of one of the Hulkbusters. Rick Jones returns to the book in issue #319 and would permanently be part of the supporting cast until the end of this series. Byrne gets a little experimental in this issue and splits each page in half and tells two story lines at once. I found it distracting and ended up reading one story end-to-end and then reading the other. This issue also really brings Betty to the forefront. Byrne has been slowly introducing her into the story line and she finally shines this issue, portraying the strong, willful character that Peter David will make use of. For more on what Byrne thought, check out his FAQ on his website. Interestingly, there's no mention of issue #320 in the letters pages; issue #323 prints letters from #319 and #324 prints letters from #321. 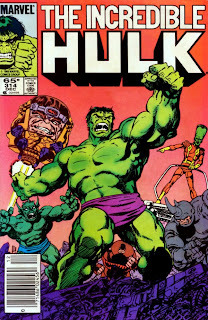 Al Milgrom, stepped up to write and pencil the Incredible Hulk after Byrne’s “departure”. His art didn’t have Byrne’s energy or intensity. You can clearly tell that Milgrom was told to get the Hulk and Banner back together. The rampaging Hulk is finally taken down by the Avengers (East and West Coast) in issue #322. And, unfortunately, Banner and the Hulk are reunited in issue #323. Issue #324 caught my attention once again as the plot twisted with the return of the Grey Hulk. 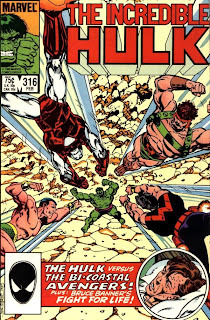 Steve Geiger delivered some great artwork in issues #325 and #326, which saw Rick Jones turn into a version of the Green Hulk and face off in a slugfest against the Grey Hulk. For a year that started out rather promising, it unraveled rather quickly. I would have loved to have seen where Byrne would have taken the Banner versus Hulk conflict. However, more creative changes were on their way which would see Al Milgrom replaced by Peter David who would make his name in comicdom writing this title. The Greatest Super-Hero Team of Any World! This miniseries is writer/editor Mark Gruenwald's Magnum Opus. He challenged many super hero conventions by taking a team of archetypal super heroes living in a world outside the Marvel Universe and allowing them to make global wide-spread changes to society and political. Golden Archer = Green Arrow. The Squadron Supreme made their first appearance in The Avengers #85. A simple misunderstanding led to an all-out battle. However, once everything was sorted out, these heroes do what comes natural to heroes: they save their worlds. After a few more appearances in the pages of The Avengers and The Defenders, there was enough fan interest for a 12-issue limited series. 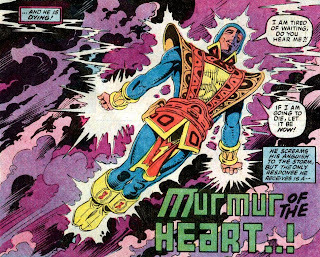 The series began in the aftermath of the Squadron Supreme's lowest point in their history. An alien entity known as the Overmind had mentally controlled the Squadron Supreme and used them to subject the planet to his rule. They rebelled against the Overmind and defeated him, but their world was in ruins and its population despised them. This series is truly Mark Gruenwald's defining work. He delivers a morally complex tale of heroes who decide to take an active role in reshaping society as they see fit. The world is in utter chaos and the Squadron Supreme wants to restore order, especially since they're to blame. 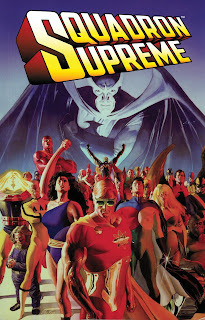 The Squadron Supreme's leader, Hyperion, convinces his team that, despite the public's mistrust and hatred, they must "actively pursue solutions to all the world's problems ... abolish war and crime, eliminate poverty and hunger, establish equality among all people, clean up the environment and cure disease." In short, they set themselves up as nothing less than moral dictators. However, Nighthawk, one of the team's founders, disagrees with Hyperion and believes that humanity must achieve and earn their own utopia and not have one forced upon them. The majority of the Squadron supports Hyperion's Project Utopia. Nighthawk resigns from the team and even considers assassinating Hyperion. 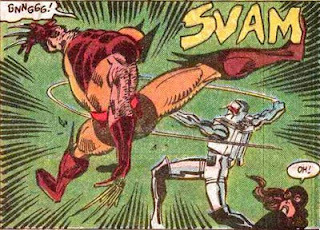 To eliminate crime, the Squadron Supreme sanctions the use of a mind-subversion machine on criminals to change their ways, which also extends to the Squadron's super-villains who are then invited to join the team. This topic sparks a series of debates on the extent of this machine's use and the determination of what behavior should be corrected. Highlights of this series's subplots include an attempt by the Squadron Supreme's scientific genius Tom Thumb to cure cancer; the manslaughter of a hero who became emotionally unbalanced when he learned that exposure to his powers are what had killed his parents; the disarmament of the United States; and the use of the mind-subversion machine on a fellow teammate by a scorned lover. The series builds to its climax as Nighthawk, who has joined forces with the Squadron Supreme's mortal enemy, Master Menace, assembles a new team to free the world from this super-hero tyranny. The climax is a dramatic and deadly battle that forever changes the Squadron Supreme. My biggest complaint is the constant shifting of the art teams. Bob Hall and John Beatty's art in the first couple of issues is well done, if you look past Beatty's heavy inks. There's a switch in inkers and then finally a new art team settled in with issue #9. Issue #7 features a great pencil fill-in by John Buscema and inks by Jackson Guice. I found that, by the end of the series, the Ryan/DeLaRosa art just wasn't at the same level that was set in the early issue. This weaker art detracted from the climatic build up to the last issue. Ryan's pencils aren't as dramatic and his panels aren't focused enough. The writing is top notch and Gruenwald handles a large roster of characters very well. The series is an enjoyable, thought-provoking read. 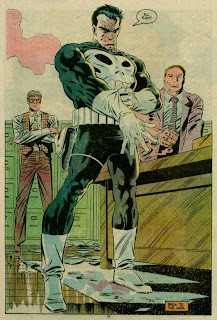 Created by writer Gerry Conway and artist Ross Andru, the Punisher made his first appearance in The Amazing Spider-Man #129 and generated enough fan interest for several other appearances. However, it wasn't until 1986 that the Punisher would help set the comic book world on a course that would spawn several Punisher titles and increase the popularity of vigilantes. 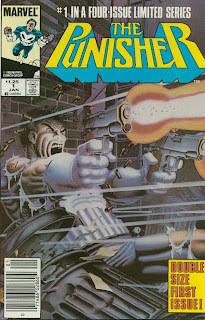 Writer Steve Grant and art team of Mike Zeck and John Beatty were given the go-ahead for a miniseries starring the Punisher. The first issue stands out for two reasons. One, that Grant tries his best at damage control and tries to bring some consistency to the Punisher's character, as he had been used by several writer for their own purposes. And two, that Grant created some depth in Punisher's one-dimensional characterization and his personality actually evolved through the series. Zeck's horizontal panel style is very effective in enhancing the story by giving it a strong flow. The only complaint about the first issue was the colour mixup (blues came out as greens). Issue #2 starts a solid gang war premise that shapes the rest of the series. A vigilante organization uses the Punisher to provoke a gang war that sets the New York underworld at each other's throats. Unfortunately, the execution of the story falls apart in issue #4 as the art seems rushed and choppy. "Before we started the series, Mike [Zeck] and I made a pact that if one of us got dumped from the series the other would walk, because Marvel was doing things like that these days. When we began the series, we were assured we would have plenty of time to work on it and get most of it done before Marvel put it on the schedule, in order for us to do it the way we wanted. "Of course, we had barely turned in the first issue when Marvel's marketing dept. decided they were short product for the summer and went through the list, found The Punisher, and put it on schedule. They worked their schedule backwards from the target release date, meaning before we even started the second issue we went from no deadline to six weeks late on it. We spent the next several months trying to play catch up while the book slipped further and further behind the schedule. "One day Mike got a phone call that they were taking him off the book. I called and protested, but was told the decision was made and could not be unmade. So I left as well. Probably wasn't the best career move I ever made but I ended up with a new best friend..."
The success of this miniseries would prompt a regular ongoing series by Mike Baron and Klaus Jansen. And as to the mix-up in terms of the covers denoting a 4 issue miniseries on the cover of issues #1,3, and 4 and a 5-issue miniseries on the cover of issues #2 and 5, check out: Comic Book Legends Revealed #196. This miniseries has recently been reprinted in Marvel's Premiere format. I was first attracted to this miniseries because of the wonderful Paul Smith cover. And then when I saw that he was doing the interior art as well, I was sold. Unfortunately, Smith’s art was heavily inked by Vince Colletta which smothered Smith’s great pencils. This miniseries was written by Jim Owsley, the man who would go on to be known as (Christopher) Priest. 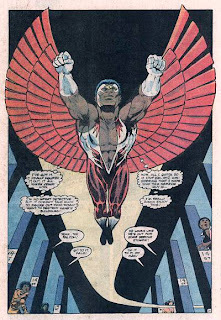 In 1983, he was also the first published African American comic book writer. The first issue focused on the Falcon’s alter ego, Sam Wilson, and his role as a social worker in the ghetto dealing with low-income housing and gang violence. Owsley does a solid job with the script and pulls off a relevant story that as applicable today as it was in 1983. This story was written years before the other three issues and circulated around the Marvel Comics offices for quite some time. 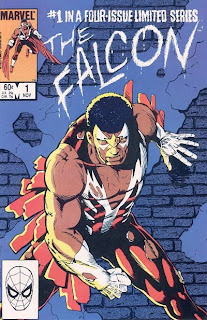 The first issue was then originally slated for Marvel Fanfare, but Jim Shooter wanted to push new idea of limited series, and decided that a Falcon limited series would be a perfect fit. Since Paul Smith was already committed to the Uncanny X-Men, the other three issues’s pencils were handled by Mark Bright, Owsley’s partner-in-crime for many other future work, like Quantum and Woody and Power Man & Iron Fist. The Falcon miniseries introduced Police Sergeant Turk who would become a popular secondary character in the Marvel Universe. Issue #2 revealed that the Falcon is a mutant as he spends the issue fending off a Sentinel. He’s able to destroy the Sentinel, but he’s unable to stop a gang war and loses the trust of a gang leader. Both the story and art work surprisingly well in this issue. There several great action sequences juxtaposed with the gang war bubbling over. Good pacing establishes the story’s tension and really makes you feel how the Falcon is pulled in both directions. In issue #3, the Falcon dealt with last issue’s fallout and was reminded of his days as “Snap” Wilson when he sold drugs, ran numbers, and operated ‘protection’ operations. And for the record, Snap Wilson did go on trial and was released into Captain America’s custody. Issue #4 had the Falcon trying to rescue the President of the United States of America who’s being held hostage by a street gang and runs into Electro. The Falcon, a former Captain America sidekick, has matured as a hero able to stand on his own and he's comfortable with putting some distance between himself and Captain America. Captain America co-stars in this issue, but doesn’t take the spotlight from the Falcon. The Falcon actually comes to Captain America’s rescue and even convinces the gang leaders to release the President and start up a dialog about improving their ghetto’s conditions. Issues #3 and #4 are bit weaker than the initial two issues. The idea that some street gang could kidnap the President of the United States didn’t sit right with me. Neither did the marshmellowy ending where Reagan sits down with the gang leaders for a chat. The Falcon is next seen in a backup feature running through Captain America that details his run for a Congress seat. 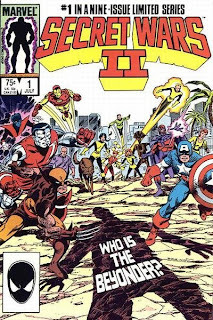 Jim Shooter, Editor-in-chief at Marvel Comics, was prompted by fan mail to create a story similar to Marvel's first limited series, The Contest of Champions. Originally called Cosmic Champions, Shooter saw this series as the fulfillment of the Marvel Universe's destiny (Comics Interview, August 1984). 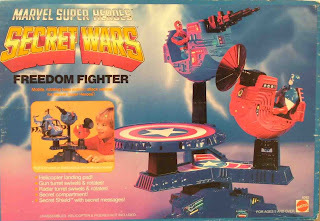 The series was renamed the Marvel Super Heroes Secret Wars and was tied in to a Mattel line of action figures and toys. This series was a financial success and would spawn a sequel, Secret Wars II. 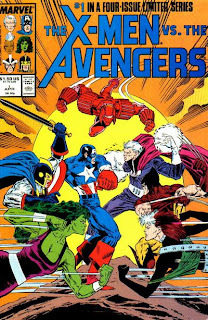 It would also later inspire more limited series involving most of the Marvel Universe's heroes, such as The Infinity Gauntlet, The Infinity War, and The Infinity Crusade. The Secret Wars featured a mysterious, omnipotent being, calling itself the Beyonder, who was intrigued by humanity and the concept of good and evil. The Beyonder whisked away the more prominent heroes and their villainous counterparts to a world that would be their battle arena. The heroes kidnapped by the Beyonder were: Wasp, She-Hulk, Captain America, Thor, Hawkeye, Iron Man, Professor X, Nightcrawler, Storm, Wolverine, Rogue, Cyclops, Colossus, Lockheed the dragon, Hulk, Spider-Man, Mr. Fantastic, Thing, and the Human Torch. The villains were Galactus, Dr. Doom, Kang, Enchantress, the Wrecking Crew (Piledriver, Wrecker, Thunderball, and Bulldozer), Lizard, Dr. Octopus, Absorbing Man, Ultron and the Molecule Man. The Beyonder plainly set the ground rules for this competition: "Slay your enemies and all you desire is yours". Galactus, who was not amused at being kidnapped, confronted the Beyonder. 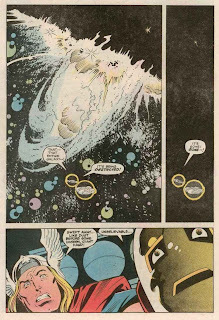 Galactus had been, until that point, the most powerful cosmic being in the Marvel Universe and was batted aside effortlessly by the Beyonder. The heroes and villains, intimidated by Galactus' defeat, began to play the Beyonder's little game. In early 1984, the characters of the Marvel Universe were undergoing a lot of changes: Jim Rhodes had replaced Tony Stark as Iron Man; Bruce Banner's intellect controlled the Hulk; Professor X could walk and joined his X-Men in battle; and Susan Richards was expecting her second child. These changes were good subplots that added a bit of depth to a rather shallow story line. Rhodes had the Iron Man image to uphold and he became conformable with his new role. Professor X came into conflict with Storm, who refused to be overruled as leader by her teacher who lacked battle experience. Reed Richards worried about Sue and their unborn child. Unlike The Contest of Champions, The Secret Wars had an impact on the core Marvel titles: the Thing's departure from the Fantastic Four and subsequent replacement by the She-Hulk; Spider-Man's new costume, that would turn out to be a living creature and become a deadly enemy called Venom; Colossus' romance that forever changed his relationship with Kitty Pryde. 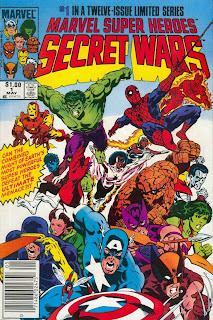 The Secret Wars as a whole prompted a closer relationship between the characters in the Marvel Universe. This series established Captain America's leadership in the Marvel Universe and the respect the other heroes had for him. Dr. Doom showed Molecule Man the full extent of his power which established him as a major power in the Marvel Universe. This series also introduced several new characters, such as Titania and Volcana, who where created by Dr. Doom, and a new Spider-Woman who joins the heroes. The Beyonder's battle world setting removed heroes from their usual locales and allowed them to engage in an all-out battle with little collateral damage or concern about civilians getting hurt. I didn't really like John Beatty's inks. They seem a little heavy and choppy. However, I liked Mike Zeck's penciled art so much I eagerly hunted down his run on Captain America. Jim Shooter's script is unspectacular, but he tries his best to build a story around a weak, action-driven plot. One of the most spectacular (and one of the more unbelievable) events occurred in issue #4, when the Molecule Man dropped an entire mountain range on the escaping heroes. 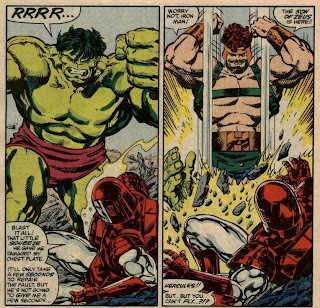 The Hulk managed to hold up part of the mountain while Reed tinkered with Iron Man's repulsor rays to tunnel them a way out. The Secret Wars #8 was the best read simply for its fan appeal. The heroes finally took the offensive and attacked the villains: Captain America took down the Enchantress, just after she subdued the Hulk; Spidey dished out a humiliating defeat to Titania; and the Human Torch defeated Ultron with his nova flame. How the villains were chosen wasn't explained, leaving the impression that Shooter had added the most physical villains (such as the Wrecking Crew), but even then, that's a questionable theory, with so many of the Hulk's foes not included such as the Leader, Abomination, and Rhino. Galactus' presence was strange especially when Byrne had strongly emphasized in Fantastic Four #261 that Galactus was a neutral cosmic entity! Interestingly, Dr. Strange, Power Man, Iron Fist, the entire roster of Alpha Flight, Daredevil, Namor, Vision, Scarlet Witch, and Moon Knight were some of the more prominent heroes left out. 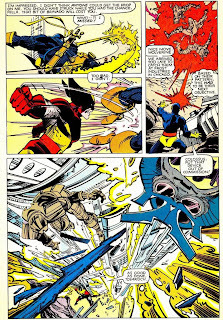 Kitty Pryde was originally included in the promo material, but later removed as one of the series' plot points involved Colossus falling in love with someone else. Another great Shooter catalyst was putting Magneto among the heroes. Magneto was slowly making the transition from a megalomaniac to simply a maniac. A few years later, Magneto would actually become the headmaster at Xavier's Institute. This plot point was a great source of conflict with the X-Men who had to reluctantly defend Magneto from the scrutiny of the other heroes. Also, another interesting twist was the Magneto and Wasp romance. The manner in which the series was released was a bit awkward. The heroes were taken in one issue of their respective issues, and returned the following issue, while the series itself ran a full year. 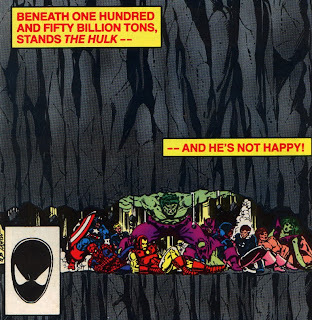 When the heroes returned to their regular issues, all the changes that would happen at the end of The Secret Wars were revealed, but had yet to happen in the actual limited series. 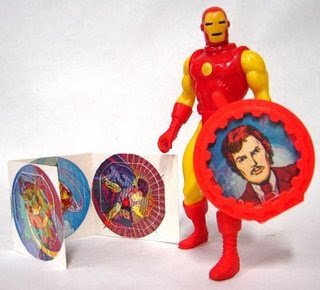 Here's a look at some of the Secret Wars toys. 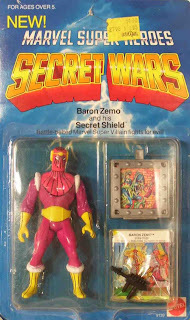 I guess Baron Zemo was a last minute drop from the villains' roster. Set in the future (circa 2070s), the Earth finds itself terrorized by an alien race of plunderers called the Horde. The Horde, while more technologically advance than humans, are content to run raids throughout the world taking what they need while humans are helpless to stop them. That is until Dr. Tuolema develops a super-power granting process, dubbed the "Morituri Process". Unfortunately, the process has one draw back in that it kills the subject within a year. 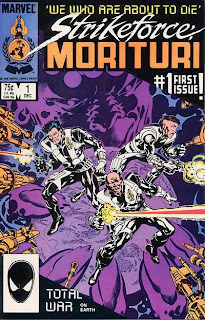 The first issue provides a wonderful introduction to the Earth of Strikeforce Morituri from Harold Everson's point of view as he volunteers to be among the first generation of the "Morituri Process". It also challenges Harold's convictions as he learns that the propaganda about the Morituri process was misleading. The second issue kicks it up a notch as the first generation of heroes are sent into the "Garden" a Danger Room-like environment meant to help stimulate their emerging powers. Our band of heroes are pushed to their limits and perhaps a bit too far testing the convictions of those running the Morituri program. The next couple of issues didn't hold my attention as much as the first two, but they did succeed in bringing the issue of their imminent deaths to the forefront, culminating in the death of one of them. I felt that this theme resonates beyond the sci-fi aspect to our daily lives reminding us how precious life is and while our life spans are quite a bit longer than those subjected to the Morituri Process, it's just as terminal. Issue #5 deals with the fallout of the death of one of their own and they have to deal with a new alien threat. Initially, I steered clear of this series as I hadn't enjoyed anything else that Peter B. Gillis had written (Defenders, Eternals miniseries, and Dr. Strange). Having recently picked up these issues in a bargain bin, I was pleasantly surprised with them. I found the overall concept rather intriguing in that Marvel would green light a series in which its characters would only last half a dozen issues or so. For those of you that enjoy Astro City, you'll get a kick out of seeing some early art by Brent Anderson. Unfortunately, the paper quality does rob some of the art's luster. Peter B. Gillis and Brent Anderson stayed on the title until issue #21 when James D. Hudnall takes over as writer along with a variety of artists, including Mark Bagley. 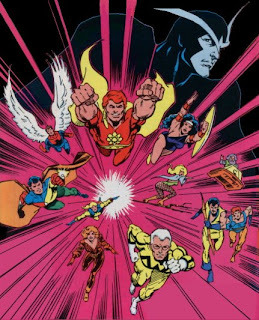 Strikeforce Morituri would run until July 1989 and end with issue #31. 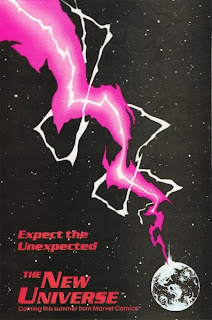 In less than a year, it would be followed up by a five-issue miniseries called Strikeforce Morituri: Electric Undertow. First appearing in Deadly Hands of Kung-Fu #22 and then sporatically through the Marvel Universe, this second string character was given a four issue miniseries. In this miniseries, he learns that his new powers are growing uncontrollable and slowly killing him. S.H.I.E.L.D. (Supreme Headquarters for Investigation and Law Enforcement Division) places Jack under house arrest in an attempt to study him and prevent his death which may result in a cataclysmic explosion. Marcy Kane, a former lover, is called into to study him since she’s an expert in biophysics. Mantlo uses good methods to avoid the expository clump of Jack’s origin, by exploring it through Marcy’s perspective as she reads through her notes. Jack learns from Marcy Kane that his mother was actually an alien from the same race as the alien attackers. His mother was an advance scout looking for a world that her people could flee to from their dying sun. Marcy also reveals that she herself is a Contraxian. After another destructive battle, Jack decides to accompany Marcy to her homeworld. A power struggle erupts on their homeworld of Contraxia where a survivalist faction plans to use Jack of Hearts as a mean of reigniting their dying sun, and not to mention securing a new position of power. Jack is framed and condemned by the Contraxia people who are all manipulated by this survivalist faction. Jack is put aboard a space ship that is targeted at the sun. There’s a change of conscience in the ranks of the villains which gives Jack an opportunity to escape, but he chooses instead to fulfill the mission and succeeds in bringing the star back to life. His powers, however, have been dramatically increased in scale and leaves Marcy and Contraxia behind to explore his destiny elsewhere in space. George Freeman’s art style works well depicting Jack of Hearts’ powers and the alien world of Contraxia. Mantlo provides strong characterization through change. A lot of nice plot twists and turns that really help pace the story and bring it to life. "Bill Mantlo's story limps under fluctuating character motives but George Freeman's all-to-infrequently-seen artwork just manages to save the series." 1980 - The Greatest of the Spaceknights! 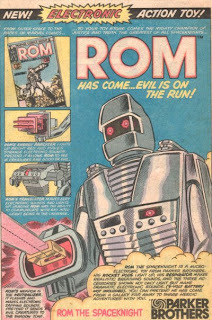 ROM was originally introduced as an action figure in 1979 by Parker Brothers. To encourage sales of the action figure, Parker Brothers teamed up with Marvel Comics to produce a ROM comic book. 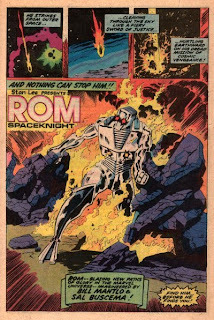 Interestingly, the ROM action figure did not sell well and faded into obscurity, but the comic book survived well into the 1980s and even spawned a Spaceknights miniseries in 2000. Two-hundred years ago, the evil Dire Wraiths threatened the peace-loving planet, Galador. In their homeworld's darkest hour, a thousand brave, young Galadorians sacrificed their humanity to become Cyborg Warriors. Though hopelessly outnumbered, these Spaceknights triumphed and pursued the remnants of the Wraith horde across the universe. Now, alone in the Enemy's mightiest stronghold, on a backward planet called Earth, one Galadorian Warrior faces his most awesome challenge. That intro blurb pretty much sums up the storyline. Veteran Marvel writer, Bill Mantlo, was called upon to chronicle ROM's adventures on Earth and was joined with usual partner-in-crime from the Incredible Hulk, Sal Buscema, one of Marvel’s most consistent and reliable artists. After doing the cover for Rom #3, Michael Golden comes on aboard as regular cover artist for the rest of the first year and provides some memorable covers. The first year of the storyline involved ROM getting acclimatized to Earth. He spends most of his time fending off the authorities as his Neutralizer weapon, which he uses to dispatch the Wraiths to Limbo, leaves them to believe that he’s killing people. Meanwhile, the Wraiths who have infiltrated humanity are more than willing to set ROM up as an alien villain and monster. Unlike a lot of series debuts these days that rely on guest appearances of Spider-Man and Wolverine, ROM does pretty well on his own in the Marvel Universe. The first real character crossover is in issue #12, co-starring Jack of Hearts. 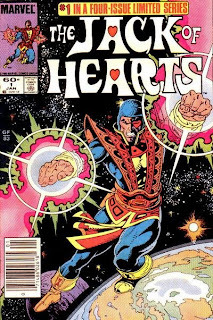 Mantlo would actually go on to write the Jack of Hearts miniseries. Mantlo continued to write the rest of the series until it was finally brought to an end due to an impasse between Marvel Comics and Hasbro (who acquired the rights from Parker Brothers). Buscema would pencil most of the issues until Rom #59 when he was replaced by comic book legend, Steve Ditko, who would finish the series with Rom #75. The X-Men and Avengers stand at opposite ends of the super hero team spectrum. The Avengers are the Marvel Universe’s premiere team working with government approval. Despite their awesome powers, the general public adores them. On the other hand, the X-Men are feared by the very people they’ve sworn to protect and are usually hunted by government. The X-Men and Avengers race to recover the fragments of Magneto’s former asteroid base that have fallen out of orbit (destroyed by Warlock's dramatic crash landing). The Soviet Super Soldiers, who want Magneto brought in to face Soviet justice, enter the fray and an all-out, three-way battle erupts. The X-Men escape with Magneto, who has rediscovered one of his old helmet that will allow him to wipe mutant prejudice from human minds. The Avengers prevent him from doing so and Magneto surrenders himself. Magneto then decides to use the helmet against the Chief Justice of the Tribunal, who is trying to promote a mutant-human war. The charges against Magneto are dropped. However, Magneto’s plan backfires as the general public cries foul and tensions between mutants and humans increase. 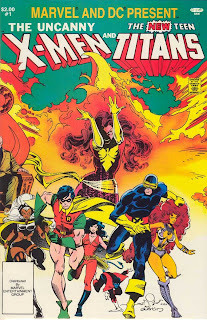 This miniseries was unusual because it wasn’t written by Chris Claremont who had seemingly written every other X-Men special and miniseries in the 1980s. The overall story is well-balanced regarding the attention paid to both teams. Roger Stern neatly handles all the characters and plot lines. The characters aren’t lost in all of the action. It was nice to see a variety of reactions to Magneto’s recent change of heart, even among the X-Men. Jim Shooter, the Editor-in-Chief, and Tom DeFalco stepped in to finish the story and Keith Pollard provided the penciled art. The final issue was a dramatic shift in terms of story and art and prevented this series from being the classic it should have been. Did some digging and thanks to http://home.hiwaay.net/~lkseitz/comics/xmenvsavengers.html, I've pieced together the following. Despite what has been reported, Roger Stern didn’t leave Marvel angry after the ending of the X-Men vs Avengers was changed. "It's 1986. Marvel's 25th Anniversary! Happy New Year! Way back in August of 1961, when popsicles where six cents, Tossin' and Turnin' by Bobby Lewis was the number one hit single, and nobody had ever heard of Viet Nam, Fantastic Four #1 appeared on the newsstands. That historic issue marked the beginning of the Marvel Universe, and the launching of the Marvel Comics Group. We were one of the smallest comics companies the, but we took off like a starship and quickly few into one of the biggies. Now, as we approach our twenty-fifth birthday, we're the largest comics publisher in the Western World - and we did it the old-fashioned way. We earned it. All this year we'll be celebrating our anniversary with special issues and events -- watch the checklist for details -- but the big even is coming up in the summer. And what is that? It will be the comics event of the century. Yes, the century. Watch for it. Jim Shooter Editor in Chief"
In 1986, as Marvel approached its twenty-fifth anniversary, Jim Shooter wanted to do something special. 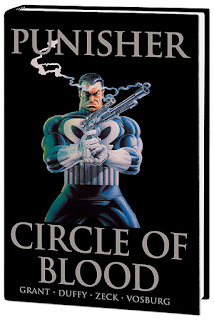 Shooter proposed the creation of a new line of comics that would exist in a different universe than the Marvel Universe. His two focal points were a back to basics approach and an adherence to realism. Well, Star Brand by Jim Shooter, John Romita Jr., and Al Williamson was the most successful of the comic line and Mark Gruenwald and Paul Ryan had put in a valiant effort with D.P. 7, but the other six titles suffered due to lackluster creative teams. Shooter's New Universe would ultimately fail. 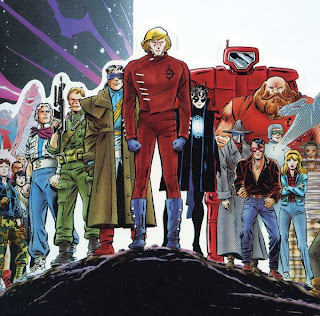 By 1989, the entire line of comics was cancelled despite an attempt by fan favorite John Byrne to breath some live back into the New Universe. 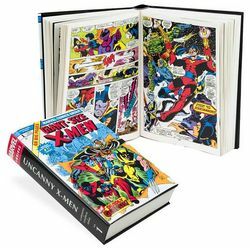 - Fans read Marvel Comics because of the established characters and the rich history of the Marvel Universe. Fans were reluctant to follow titles that played no part in the Marvel Universe and had no involvement with any Marvel Universe characters. - The New Universe ultimately competed against the Marvel Universe. Comics Fans usually have a limited budget and given the choice between Spider-Man and Star Brand, Spider-Man will win every time. - Couldn't possibly live up to the hype. "The New Universe from Marvel Comics marks a revolution in comics equal to the birth of the Marvel Age in 1961." - Bullpen Bulletins October 1986. While Jim Shooter, Archie Goodwin, Tom DeFalco, and John Romita Jr. are talented individuals, they aren't Stan Lee, Jack Kirby, Steve Ditko! - Comic books fans had already expressed their displeasure with multiple universes. DC Comics had multiple Earths each with their own distinct set of super-heroes, but it was too complicated for the average reader to follow. In 1985, DC Comics put out a twelve issue series called Crisis on Infinite Earths and merge all of their multiple Earths into one. "The New Universe was dead long before it saw the light of day. Two years before the Marvel 25th Anniversary, when pressed by the president and executive staff for a "publishing event" for the anniversary, I suggested that we might want to commemorate the birth of one universe with the birth of another. Everybody liked the idea. I was given a substantial budget and told to proceed. Now, of course, no one, not Stan, who isn't one to swim against the tide, will admit to ever having thought it was a good idea. " 1982 - X-Men Versus the New Teen Titans! As a comic book fan in 1982, you just couldn't ask for anything more. 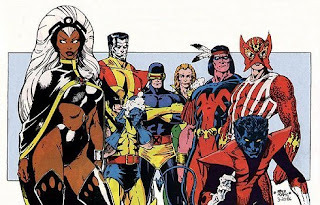 While the Justice League of America and the Avengers were caught in a spiral downwards in terms of quality and talent, the X-Men and New Teen Titans were quickly making their mark in comic book history. Both titles shared a lot of similarities: a young core of rookie heroes each struggling with their own degrees of teenage angst, great writing, fabulous artwork, solid character development, and fine storytelling. With the individual success of each title, it wasn't long before both Marvel and DC realized that they could make even more money by publishing a crossover issue. But neither side cheaped out. While it seemed to be an issue creatively directed from a Marvel perspective, it certainly didn't show in the final product. X-Men writer, Chris Claremont was called upon to write this issue and needs to be given some real credit for this issue. I also collected the New Teen Titans at that time and was really impressed at how Claremont handled the Titans. Not only does he faithfully portray both teams, but he also handles their interaction very well, particularly the flirting between Kitty and Changeling. Let's not forget Walter Simonson and Terry Austin who provide the art. They successfully captured the look and feel of both teams. 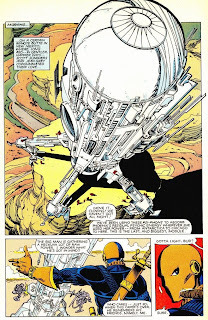 Simonson's dynamic art is just a pure pleasure to take in. The story is as follows. Darkseid sets into motion a plan to recreate the Dark Phoenix by tapping into the memories of her former teammates, as well as drawing the residue of her power from a variety of sources. Despite their best efforts, each team is defeated and captured by Deathstroke the Terminator and Darkseid's shock troops. Darkseid brings the Dark Phoenix back to life. Both super teams work together and free themselves and take Darkseid, Dark Phoenix and Deathstroke in a climatic battle. Professor X and Cyclops convince Dark Phoenix that she's being manipulated and she sacrifices herself to deal with Darkseid. Claremont courageoulsy defies tradition by filling an unbalanced basket of guest stars and Walt Simonson's first-rate pencils contribute to the finest Marvel/DC co-production. “Elektra’s origin directly parallels that of Daredevil. Both of their lives were irrevocably changed by the loss of a father at the hands of a criminal. Each responded differently. Matt gained a resolve to seek out and battle crime. 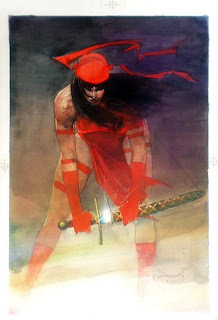 However, the pain was too great for the younger, less mature Elektra. She abandoned her ideals, and struck out against the world." Elektra, I believe, was the second Marvel mainstream character (Silver Surfer being the first) to go over to the Epic imprint. However, it was the first real test of Epic imprint as the adult subject matter was a far cry from the average Comics Code Approved Marvel story. The story is very dense. It took me several reads of the first couple of issues before I really got into the story, and a couple of reads of the entire miniseries before I really figured out what was going on. The first couple of issues set the stage, introduce the main characters, and delve into Elektra’s past, exploring her motivations and influences. The cyborg Garrett is a good choice as a supporting character. He is Elektra’s opposite in his attitudes, his cybernetic enhancements, and beliefs. Elektra and Garrett “team up” to prevent an evil entity, known as the Beast, from seizing control of the United States presidency. Miller effectively uses only dialog or monologues, like television broadcasts and video reports. These techniques were also well seen in Batman: The Dark Knight. He pushed the boundaries of comic storytelling, especially in the first couple of issues, where he used an innovative non-linear style that reflected Elektra’s drugged perception. I won’t even bother trying to praise Sienkiewicz’s art. I don’t have the words to faithfully describe his art. Suffice to say that it was a drastic departure from his more realistic, Neal Adams influenced worked on Moon Knight. It is an acquired taste and took me awhile to grow to like it. 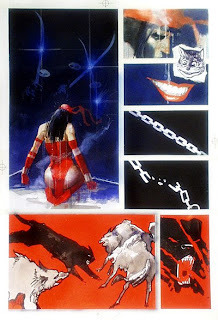 "Elektra: Assassin employed a somewhat wider array of techniques [than the DD graphic novel] because it tended to be a wilder ride. (...) Elektra was all over the place: “realistically" drawn characters interacting with caricatures interacting with cartoons interacting with photocopies interacting with "children's drawings". There were quite a few styles employed, but the determining factor for the choice of style was what the scene demanded. In essence, the scene dictated the style of artwork used, not vice versa." It’s difficult to be precise about when the events in this miniseries occurred, but this story seems to pre-date her first appearance in Daredevil #168. What backs this up? Well, Elektra mentions Matt and doesn’t refer to him as Daredevil. And not to mention the subtitle of this miniseries, “The Lost Years”, which would seem to me to infer to the time when she leaves Matt after her father’s death and before she meets Daredevil as Elektra. Elektra met her end in Daredevil #181, in one of Miller’s greatest Daredevil storylines. She is later brought back to life in the graphic novel “Elektra Lives”. The Marauders – professional mutant assassins, employed by a mysterious evil, with the job of wiping out the entire Morlock community living beneath the streets of Manhattan. And the only hope of salvation the Morlocks have rests in the hands of the X-Men! But can they stop this deadly onslaught? And what do they stand to lose if it should succeed? Collecting UNCANNY X-MEN #210-214, X-FACTOR #9-11, NEW MUTANTS #46, THOR #373-374, POWER PACK #27 and DAREDEVIL #238. 1982 - Let the Game Begin! The Contest of Champions launched Marvel's new initiative to publishing self-contained miniseries featuring fan-favorite characters. The success of this miniseries would launch the Hercules, Vision and Scarlet Witch, Wolverine, and Hawkeye miniseries. 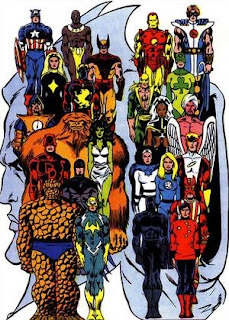 Jim Shooter would also carry forward this idea and create the Marvel Super-Heroes Secret Wars in 1984. This story was originally planned to be published as a Treasury Edition as an homage to the Olympics, but when the United States withdrew from the International Games in early 1980, this project was shelved. 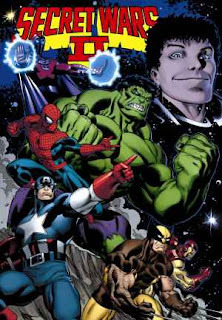 Two years later, Marvel brushed off the dust and touched up a few things to make up for what had gone on in the Marvel Universe since and put out this miniseries which highlighted a cast of international heroes. Talisman, Sabra, Arabian Knight, Defensor, Le Peregrine, Shamrock, Blitzkrieg, and Collective Man all make their first appearance in this miniseries. The plot is straightforward. The Grandmaster and a mysterious entity, later revealed to be Death, gather all of the Marvel Heroes and pick from them to act as champions in their competition. If the Grandmaster's team wins, Death will restore his fellow Elder, the Collector, to life. But if he loses, Death will take the Grandmaster's life. The first issue is rather dull as each hero gets plucked out of their daily routine. They're addressed by the Grandmaster who explains the rules and then along with Death picks their contestants. The second issue pits Daredevil, Darkstar, and Talisman against Sunfire, Invisible Woman, and Iron Fist for the first piece of the Globe of life, as well as Iron Man, Arabian Knight, and Sabra versus She-Hulk, Defensor, and Captain Britain for the second piece of the Globe of life. And, in the final issue, Vanguard, Angel, and the Black Panther face off against Wolverine, Thing, and Le Peregrine for the third piece of the Globe of life, as well as, Storm, Shamrock, and Collective Man are up against Sasquatch, Captain America, and Blitzkrieg for the final piece of the Globe of life. The Grandmaster wins the contest, but learns that Death is not a force to be challenged lightly. While this miniseries may not stack up against some of Marvel's best stories, it's still an entertaining read. It was interesting to see some of the Marvel characters meet each other for the first time, like Wolverine and Black Panther. I also enjoy cosmic story lines involving the Elders of the Universe so with appearances by the Grandmaster and the Collector, it made this miniseries enjoyable. 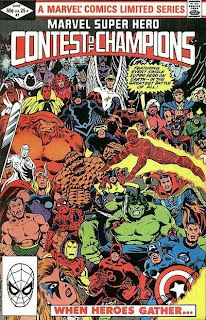 As a precursor to the Official Handbook of the Marvel Universe, which would hit the market in 1983 and then the deluxe version a few years later, each issue offers a brief write-up on every Marvel character as well as listing their first appearance. A sequel to this event was published in 1999. Nightcrawler has long been one of my favorite X-Men and it was nice to see him get his own miniseries. Dave Cockrum, who co-created Nightcrawler with Len Wein, wrote and drew the entire miniseries. Nightcrawler's attempt to rescue Kitty’s pet dragon, Lockheed, during a Danger Room scenario lands them both in an alien dimension. 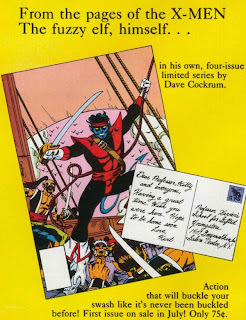 Fortunately, Nightcrawler finds himself at home among sky sailing ships and pirates. After a couple of issues, Kitty and Illyandra yank him out of that dimension and throw him into another which resembles that of Kitty's fairy tale from The Uncanny X-Men #153. The first two issues are a lot of swashbuckling fun and high adventure. Unfortunately, the last two issues are less memorable with a story line that weakly parallels the Wizard of Oz with Kitty/Dorothy, Colossus/Tin Man, Wolverine/Lion, and the Nightcrawler/Strawman. There’s only so much cute you can put up with and it seems to me at least that it went one for a bit too long. I was disappointed with this miniseries since it had no real character development. Nightcrawler’s past and origin, which was partially revealed in The Uncanny X-Men Annual #4, never surfaces in this series. No attempt was made to pick up the ongoing X-Men plot thread about his relationship to the mutant shape-shifter Mystique. It was also unfortunate, that Amanda Sefton, Nightcrawler’s girlfriend didn’t play any role in this series. There's just not enough I can say about this comic book. This issue stands out as one of my favorite New Mutants stories and perhaps my favorite 1980's story. This issue spotlights Chris Claremont at his peak, in my opinion. He's all about characters and his characterization takes center stage in this issue. He took the New Mutants and put them in an unfamiliar setting and forced them to change and to adapt. This isn't your run-of-the-mill character change either. These events and shifts in attitudes, particularly with Mirage (Dani Moonstar) and Karma, forever changes them. Claremont did a spectacular job isolating each member of the New Mutants, which allowed him to explore their character in depths and then by the end of the story brings them all back to together after they've changed. 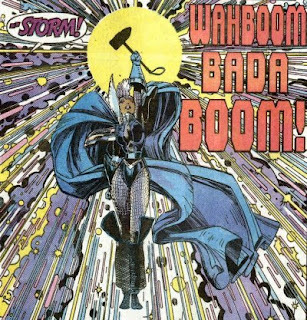 This issue established Arthur Adams as a great artist. His rich and detailed pencils are truly beautiful and breathtaking. Add to it, the veteran inking of Terry Austin and you've got some of the best 1980s art. Unfortunately, the only detriment to the art was the weak colouring. It's probably due to the horrible colouring techniques of the 1980s. I should probably pick up a copy of the trade paperback and see if they've recoloured it. Story: After his humbling defeat in the X-Men and Alpha Flight miniseries, Loki dispatches the Enchantress to capture Storm and the X-Men. The Enchantress and her demon warriors capture Storm and the New Mutants, who are mistaken for the X-Men. Illyandra frees the New Mutants, but her spell is disrupted by the Enchantress which scatter the New Mutants throughout Asgard. Karma spends awhile in the desert shedding her unwanted girth. Sunspot befriends the Warriors Three and enjoys the Asgardian lifestyle. Cannonball earns the respect and friendship of the Dwarf King. Mirage finds her fate intertwined with the Valkyrie and assumes her place among their ranks. Magma gets mixed up with the fairies and actually became one for awhile. Wolfsbane meets the Prince of Wolves and falls in love. Cypher has a rough time until he met up with Warlock and they team-up. 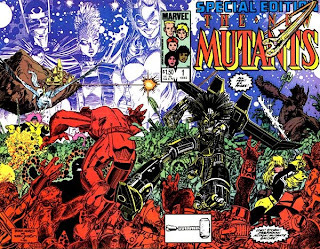 The Enchantress tracks down the New Mutants, but the New Mutants regroup and defeat her. Illyandra leaves the Enchantress in her Limbo at Sym's mercy. They then decide to return to Asgard to rescue Storm. Meanwhile, Loki has forged a new hammer for Storm which grants her powers over the weather once again. This annual picks up where the New Mutants Special #1 ended and certainly didn't waste any time. Illyandra gets a message back to Rachel (Phoenix) about their predicament. The X-Men make their way to Asgard and catch up with the New Mutants. The infiltrate Loki's castle. Wolverine and Kitty confront Loki and he has Storm attack them. Wolverine finally gets through to Storm and she turns the tide of the battle. She rejects Loki's gift and destroys the hammer. Loki capitulates and returns them all to Earth. Arthur Adams' art continued to show his versatility in handling a rather large cast of characters in a alien environment. His detailed pencils are well suited to lavishness of Asgard. Unfortunately, the poor colouring just doesn't do his art justice. Claremont is forced to give over a bit of the spotlight to the X-Men which pulls away a bit from all the character development he did with the New Mutants. I would have liked to them earn the victory on their own rather than having to call upon the X-Men for help. One note though, these issues, upon re-read, do seem a bit dated with a lot of references to the 1980s, like a cameo appearance by Remington Steel and Ms. Holt. Also worth noting, this omnibus doesn't include Rom #72 or Micronauts #16 as Marvel Comics no long has the rights to these franchises. 1985 - Return of the Beyonder! As I picked up the ridiculously large Secret Wars II omnibus, I thought I'd post an entry about this infamous 1985 miniseries. Marvel Comics hoped to capitalize on the financial success of the Secret Wars and released a follow-up limited series called Secret Wars II. The series turned out to be a disaster and failed on several levels. Despite the crossovers, the series didn’t sell as well as the original one. The art, which was one of the bright spots from the original series, was significantly weaker. Jim Shooter returned as the series’ writer, but hadn’t learned anything from the harsh criticism of the original Secret Wars series. The plot is buried in the crossovers that are juggled by dozens of different writers. With his curiosity peaked in the Secret Wars, the Beyonder made his way to Earth and assumed a human form based on Captain America’s body. He wandered about the Marvel Universe experiencing everything humanity has to offer. He visits practically every Marvel character. 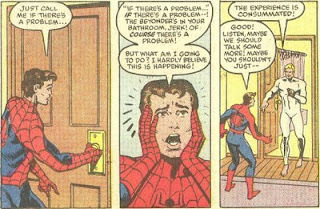 Highlights include Peter Parker (Spider-Man) showing him how to use the bathroom, and Dazzler rejecting the Beyonder’s attempts to “court” her. The Beyonder went through several stages of development. He began with curiosity which developed into a frustration with humankind. He took another turn and decided to become a super-hero, but even then he doesn’t find his purpose. He finally settled on becoming human. 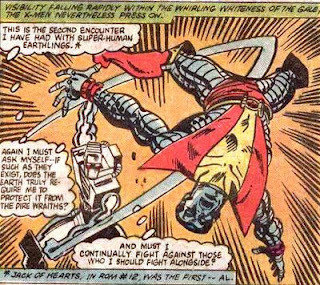 However, the process was interrupted and the Beyonder dies during his "birth". "The inherent fatal flaw in this is that no human writer can convincingly portray utterly omnipotent characters, and Jim Shooter proceeds to demonstrate this. The resulting escapade depicts a spoilt two-year-old brat with limitless power flitting around the globe as multitudes of heroes chase mindlessly." Shooter pulled out a lot of themes, like power corrupting, stranger in a strange land with an omniscient twist, good versus evil, and the purpose of life. However, they were like signposts passed by a speeding car. A brief, blurry glimpse of an idea that was quickly left behind. Shooter’s story was weak and painfully drawn out into nine issues, which includes a double-sized finale. The story was also distorted by the obscene amount of crossovers (33 issues!). The heroes in this series were cardboard cutouts who attack the Beyonder in waves, with no real strategy or reason. Just as in the Secret Wars, the characters behaved the way Shooter interpreted them and not how they were necessarily portrayed in their own series. The ending was simply bad. 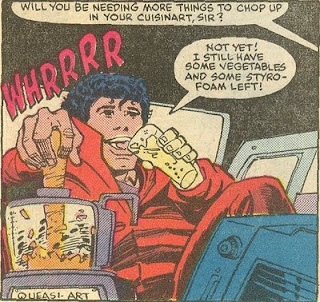 If the Beyonder is omniscient, why would he need to construct a machine that could make him human? Wouldn’t he just think it and it would happen? The machine plot point existed only to give the heroes a realistic chance at stopping an omniscient character. The combination of Milgrom and Leialoha was a mistake. Their art styles clash. Milgrom’s penciled art required a good finisher and Leialoha’s inks are just too loose and scratchy. There are several pages, mostly at the end of issues, where the veteran inker Joe Rubinstein helped finish the issue, and those pages are superior to Leialoha’s art. Take a look at the early issues of The West Coast Avengers where Joe Sinnott provides the inking and compare for yourself. If this series accomplished one thing, it captured a snapshot of the 1980s. From the Beyonder’s perm, to the Dazzler’s leg warmers, to Ronald Reagan; it’s all there in its 80s glory. With geocities.com closing down, I thought about relocating my Marvel 1980s website, but then decided that it might be a better fit as a blog. Every week, I'll take a look at something from Marvel Comics in the 1980s.